Who doesn't like onion dip? Especially with a huge bag of salty, crunchy potato chips? I remember my sister-n-law and I were hanging out watching cooking shows during our vacation quite a few years ago (this is back when we didn't have to worry about calories and carbs so much). She and I gleefully cleaned out a giant bag of Ruffles with a vat of onion dip. Of course, I hated myself that night, but boy was it fun! 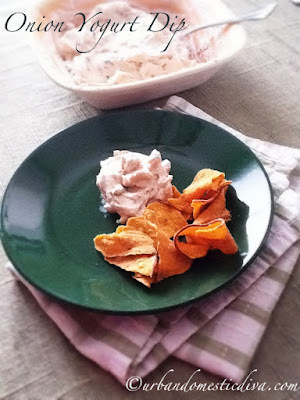 I have been on the hunt for a healthier onion dip to serve to guests, and I ran across one that was workable on the Food Network's website. The one thing I wanted to do was kick up the onion flavor by caramelizing the onions first before adding it to the creamy mixture. This includes a thick, greek yogurt as a base. I think you can substitute a low-fat sour cream and still call it "sort-of healthy". But yogurt has other great health benefits that make it a worthy ingredient in this snack. Because I made this for gluten-free guests, I served it with gluten-free sweet potato chips seasoned with black pepper. It was a huge hit! Dice the onion. Over medium heat, melt the butter with the olive oil in a saute pan. Add the onion and white part of the scallions. Cook until golden brown and caramelized. This takes about 10 minutes. Stir occasionally and monitor your heat. When done, take off the heat and cool down to room temp. In a medium bowl, whisk the yogurt with the mayo, green scallions, garlic powder, salt and pepper. Add the cooled onions with oil and all. Mix well. Cover and allow flavors to marry for a few hours before serving in the refrigerator. Let sit at room temp for 10 minutes before serving with your favorite chips or cut vegetables.